Simple: take 2 investment strategies that work really well, combine them and get exponential results. 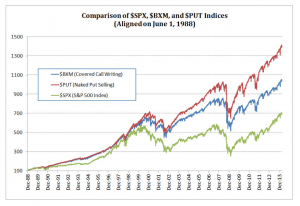 The red line in the chart below shows the PUT option writing index compared to the S&P 500 index. In 25 years the PUT index almost beats the S&P with a factor of 2. Putting A & B together, it is not hard to see the exponential results you can achieve with this strategy. 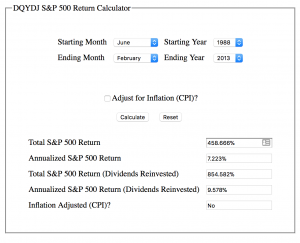 Most people think of compounding in one dimension. Basically reïnvesting interest and dividends they receive. Multi-Dimensional compounding takes advantage not only from the present but also of future cashflow (think dividend income, % of savings, commisions, rental income, etc) I wrote a separate blog post on Multi-Dimensional compounding here. How are we doing Multi-Dimensional compounding practically? We will be writing out-of-the money put options on dividend paying stocks for the amount of the Cashflow or capital that is not invested yet.